New this week on OTPbooks.com — If fat loss happens in the kitchen, what’s the point of all that exercise? 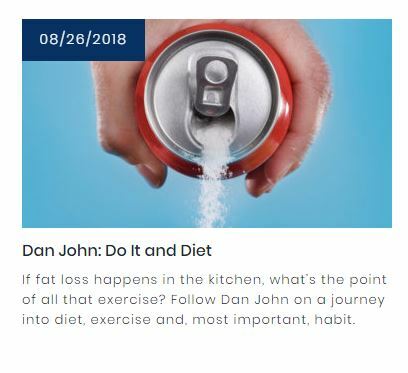 Follow Dan on a journey into diet, exercise and, most important, habits. I just walked in from a nice four-mile hike throughout Geilo, Norway. We had a delightful morning rain and we were able to get our walk in before the next set of showers arrive. I’m here to talk at the AFPT Conference and I spent a lot of time prepping my workshop. I wrote an article for OTP on the topic, Do It or Diet, and I am a little nervous. I woke up last night worried about my presentations. I get nervous before every talk…I always have, by the way. I still think it is a good sign, and I think we all worry about public speaking, but dealing with jet lag and nervousness is simply not fair. This trip includes a workshop, a wedding and a visit. My parish priest is in Thurles, Ireland, and I am going to visit the home of GAA (Gaelic/Irish sports). Semple Stadium is named after the father of our old parish priest, so this will be a fun trip. Sandwiched between the workshops and Thurles is an Irish wedding. There is NOTHING like an Irish wedding in Ireland. I thought we had some fun in South San Francisco, but these are the real deal. When Adrian Cradock got married, I tapped out at 4:00 am and the groomsmen dropped by at 7:00 am to go swimming in the Atlantic Ocean. Maybe it is me, but the articles on the internet lately have been shorter and shorter. I did find some things, but so many articles have “click bait” and these odd videos that pop up on my screen as I try to read them. It’s not me! This article shows us a glimpse of the future. I saw BikeJames last week in Long Beach. I am trying out his new isometric program. As I was following his video, I saw this article. All too often, people discount and miss the key to the One Lift a Day program. Oh…what is that? Work hard on the basics! First, it saves a lot of time. Since you are only working out for 15 minutes (or less) it is much easier to fit the workouts into your schedule. Worst case scenario is that you get up 15 minutes earlier or stay up 15 minutes later – either way, if you can’t find 15 minutes to devote to your overall strength and wellbeing, I don’t know what to say. Second, since you can only do one exercise at each workout you have to choose very wisely. You don’t get to add in exercises just because you liked them or saw them on the internet the day before – you have to focus on the exercises that will, rep for rep, will deliver the most results. Well, I have to get a quick workout in and perhaps a swim before I speak. I could probably use a nap, but they are doing construction outside my window. “I will keep the foul thing for Balan,” thought the Wart, resuming his search for his tutor. He found him without trouble in the tower room which he had chosen when he arrived. All philosophers prefer to live in towers, as may be seen by visiting the room which Erasmus chose in his college at Cambridge, but Merlyn’s tower was even more beautiful than this. It was the highest room in the castle, directly below the look-out of the great keep, and from its window you could gaze across the open field—with its rights of warren—across the park, and the chase, until your eye finally wandered out over the distant blue tree-tops of the Forest Sauvage. This sea of leafy timber rolled away and away in knobs like the surface of porridge, until it was finally lost in remote mountains which nobody had ever visited, and the cloud-capped towers and gorgeous palaces of heaven. Merlyn’s comments upon the black eye were of a medical nature. There seemed to be no sensible reply to this. I think it is well worth reading with some of the best love poetry in history. But, let’s get back to Merlyn is his tower. Desiderius Erasmus Roterodamus (died 1536) was one of the first “humanists.” A Catholic, he was critical of the Catholic Church and called for reforms, but did not leave the church. He emphasized “Via Media,” the middle road, respecting much of the work of the Reformers but also holding on to the Tradition. As always, the middle way seems to anger everyone. Wart and Merlyn’s conversation includes many “unsaid” things. I find this particular interaction to highlight Wart’s maturation and Merlyn’s ability to see it, too. As I type this, my daughter has just had her ten-year reunion and I still worry about her riding her bike alone on the street. Let’s just leave this here. Let’s let the unfairness of the situation sit for a moment. And sometimes, that is all we can do: admit it.